By CHARLES PULLIAMThe Heritage Foundation of Franklin and Williamson County’s request to purchase the old, old jail received approval from the Board of Mayor and Aldermen Tuesday night at Franklin City Hall. Ever since the Heritage Foundation of Franklin and Williamson County first supported FirstBank’s leasing of the Five Points Post Office building last year, Executive Director Mary Pearce and other foundation leaders eyed a possible 2-for-1 in restoration and preservation with the exchange. 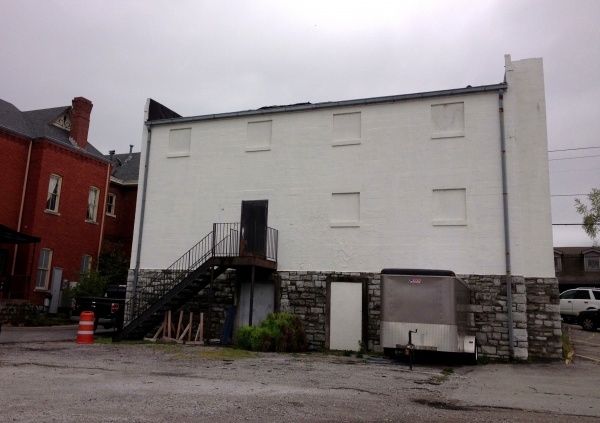 The other possible project: the old, old jail at 112 Bridge Street in Franklin. Pearce and other Heritage Foundation leaders were all smiles Tuesday exchanging hugs and ready for the next step. The foundation’s request to purchase the roughly 6,800 square-foot building and its downtown property received approval from the Board of Mayor and Aldermen Tuesday night at Franklin City Hall. In February, the foundation offered $25,000 to take over the deteriorating building and spend an estimated $1.5 million to make the 3-story brick structure the new foundation home and community restoration project. Aldermen voted unanimously in favor of the exchange despite several worries from residents saying the downtown property is worth much more than the purchase price. City Administrator Eric Stuckey said the tax dollars saved by the city, which won’t be taking on the expensive restoration, as well as the impressive track record of the foundation for investing in and preserving historic Franklin structures made the decision a simple one. In 2007, the city acquired the Five Points Post Office building and the old, old jail during a land swap with Williamson County. Officials have been trying to attract developers to the jail since 2010, but no one has taken on the renovation project to bring the rugged concrete block structure up to date. It was declared surplus property in 2009. Stuckey said the building is “in a state of great disrepair.” He said the project mirrors the restoration projects the city has approved and partnered with other groups to restore the Park at Harlinsdale Farm and the Five Points Post Office. The foundation spent some three years and raised more than $8 million to transform and reopen the Franklin Theatre in 2011. “Over the past year we’ve taken an aggressive stance at restoring, preserving, updating (and) revitalizing prehistoric properties that the city owns,” he said. “I look forward at seeing what this could become. The Heritage Foundation is a non-profit organization that works together with more than 1,000 members to protect and preserve historic resources and continue the revitalization of historic downtown Franklin. The foundation has been housed in the Five Points Post Office building for about 11 years. As part of the recent 20-year lease agreement with FirstBank for the historic post office building, the foundation will move from its current location by mid-July. Follow Franklin Home Page for more updates Wednesday from the Board of Aldermen meeting. Charles Pulliam is a reporter for Franklin Home Page. Email him at charles@franklinhomepage.com. Follow him on Twitter @cspulliam.